Sing your heart out to your favourite tunes with the Archeer Microphone Bluetooth Karaoke Speaker. How to sing or record by bluetooth? 1.Long press the power button,the blue light will be on. 2.Turn on bluetooth setting on your mobile phone,search the bluetooth name "YSD" and pair. The device will be a sound alert if connecting successfully. 3.Download a YouTube or Yokee,searching your favorite song then can start. How to sing or record by cable? 1.Plug the micro USB port into microphone device and 3.5mm audio port into cellphone. 2.Open karaoke app or recorder app(the app must have recording function),choose a favourite song and sing then save. How to use the usb ball light? 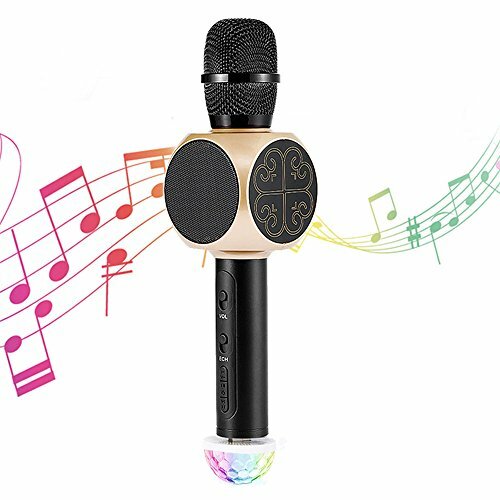 ♫ 【3 in 1 Karaoke Microphone】 ARCHEER Multifunctional Wireless Microphone can be used as a microphone, bluetooth speakers, recorder or power bank. Perfect for home KTV singing, gathering singing, family entertainment, travel singing, car Stereo, instrument recording, interviews and live etc. It is also a ideal gift for kids and adults alike. ♫ 【High Compatibility & Portable】 Easily connect your iphone, iPad, Android smartphone via Bluetooth (Range: 10M) or 3.5mm audio cable, play your favorite songs and sing your heart out! Besides, it supports Micro SD card (max to 64GB) and song switch which means that you may enjoy singing even without having your phone. ♫ 【Stereo Effect & KTV Live-sound】Professional tuning system, three-layer high-density noise reduction, 4W loudspeakers, intelligent mixing chip, giving you more stunning KTV live-sound, and clear music rhythm with echo reverberation. ♫ 【Bonus Disco Ball Party Light & Phone holder】 Every order comes with a FREE disco ball light, a cellphone holder ( Fit all phones sizes range 2.35-3.35" ) and a portable carrying case, worth over $20!! Meet all you need! Make you a romantic and harmonious atmosphere for your family or friends, light up your karaoke night! ♫ 【Longer Singing Time & Easy to Use】Built-in 2200mA lithium battery. You can continuously use it for 4-6 hours (in the customary charge for 3 hours after full power). Simply turn it on and connect your blueototh devices, ready for use. You do not need any complicated devices for karaoke, DVD player, TV. View More In Karaoke Equipment. If you have any questions about this product by Archeer, contact us by completing and submitting the form below. If you are looking for a specif part number, please include it with your message.